The Beis Shloime congregation came into existence in 1906. It rented its quarters — first at the corner of Viger Street and St. Denis, and subsequently at St.-Laurent and Prince Arthur — for some fourteen years, over which time it managed to amass the resources it needed to acquire the duplex that then stood at the intersection of Clark Street and Bagg. That duplex had its own story. The lot on which it stood was part of a much larger tract, stretching up and down what is now St-Laurent Boulevard, that had passed through inheritance to Dame Catherine Mitcheson, widow of Stanley Clark Bagg, the individual for whom both Clark and Bagg Streets are named and, till his death in 1873, the largest non-institutional landowner in the city. In 1899 she sold the lot to one Alfred Gauthier, stone mason, who built the duplex in fulfillment of the mandate she laid upon him to construct housing for the middle class. The duplex passed to a Jewish owner in 1910, and from him to the congregation on March 9, 1921. 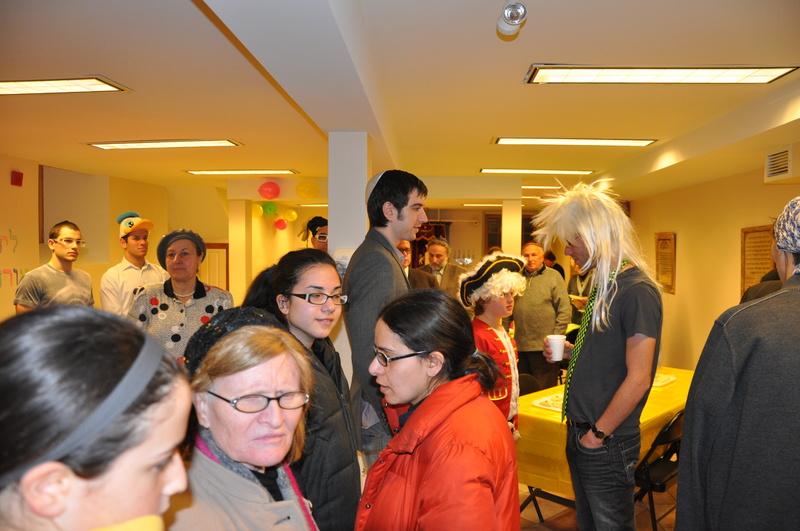 The congregation turned to one of its own to convert the duplex to a synagogue. 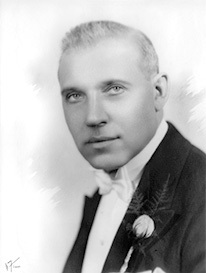 Baris Kaplan had come to Canada in 1905, a refugee from the pogroms that beset Russia’s Jews following the failed Bolshevik revolution of that year. Ten years later he started B. Kaplan Construction — today, Montreal’s oldest construction company, still in its original offices on Hôtel-de-Ville Street, still in his family. 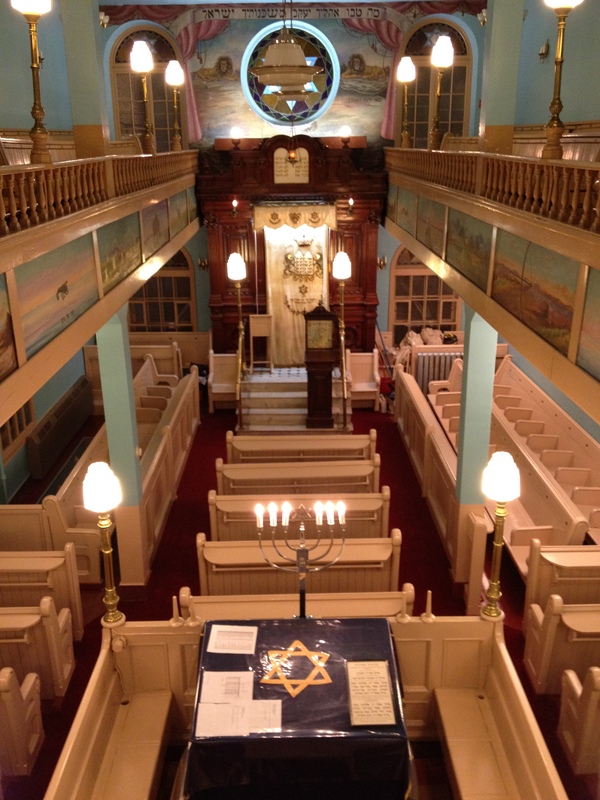 The building wrought from that old duplex is presently Montreal’s oldest living synagogue; there are congregations that are much older, but their facilities are not original. In a neat twist of history, it has turned out that both the old shul, and the company that built it, together outlived their contemporaries, and are managed today by grandsons of Baris Kaplan. The duplex and land had cost $10,600; the renovation, including eastward extension of the building by some twenty feet, approximately $2700 more. 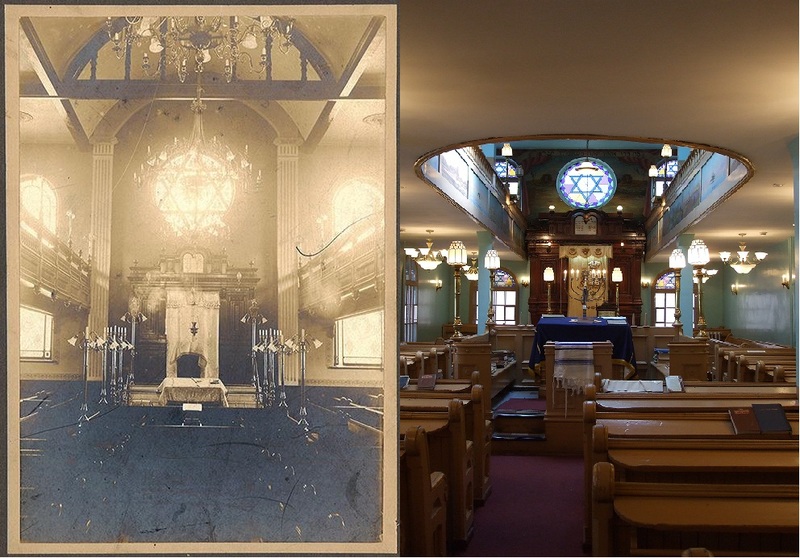 An additional $1500 purchased the pews, brass lamps, bimah and aron sold off by the Shaar Hashomayim congregation upon its move in the fall of 1922 from McGill College Avenue to its present quarters in Westmount. Multiply by 50 to convert these amounts roughly to present dollars. Left side: Interior of the English, German and Polish Synagogue (later renamed the Shaar Hashomayim Synagogue) on St. Constant Street (now du Bullion St.) in 1866. Right side: Bagg Street Shul today. 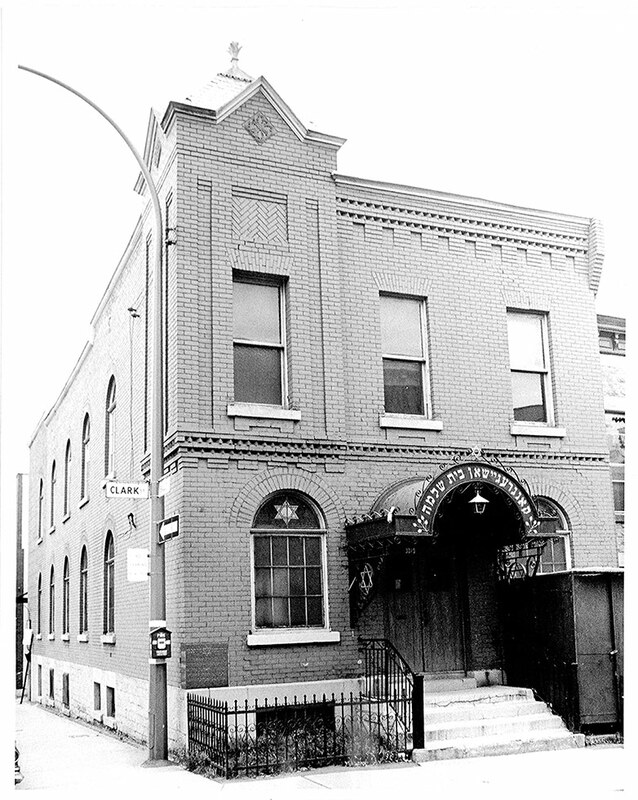 Through the twenties, thirties and forties, the Bagg Street shul, like the dozen or so others in its neighbourhood, flourished. But with the post-war migration of Jews to the north and west, the shuls of the Plateau began to close their doors, one after the other. Their ghosts can occasionally be discerned in the architecture of some of the old buildings left behind, and in the multiply-hyphenated names that adorn many of the synagogues found today in Côte-des-Neiges and Côte-St.-Luc. With the demise of the Nusach Ari about a decade ago, our shul remains the Last Man Standing in the Plateau. How come? Certainly Joe Brick is a big part of the answer. Joe never married. He lived his whole life, from birth to death, in the Clark Street flat his parents had owned a few doors south of the shul. 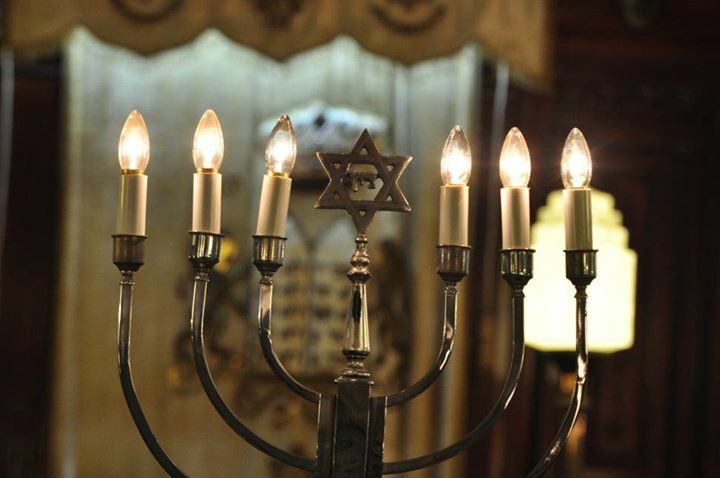 As the membership began to decline, the key to the shul, and ultimately its administration, passed to him. Through some forty years, till his death in 2009, he kept that building open. Devotedly. Shabbos and holidays only, for a minyan that by the 1990’s was literally dying away. It is probable that Joe, like his fellow congregants, never had much money. Certainly, he never spent any. 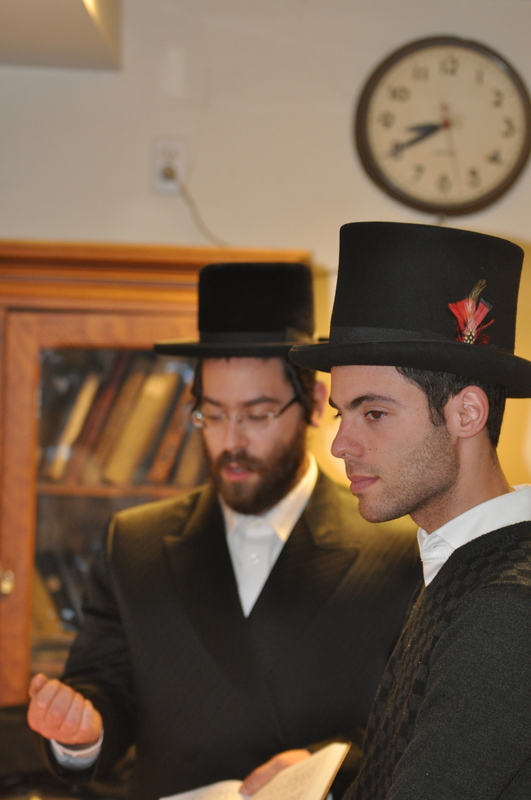 He was forever soliciting money for the shul, but from people who had none to give. And not so slowly, the building was falling into ruin. 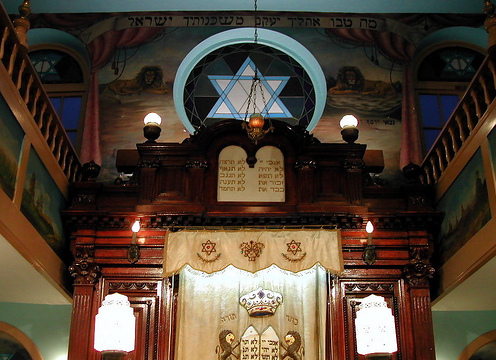 In the early 1990’s, Montreal’s Catholic, Protestant and Jewish communities — the latter represented by Joshua Wolfe, at the time head of the Jewish Built Heritage Committee and previously director of Heritage Montreal — joined forces to sensitize the Government of Québec to the heritage importance and historic value of the city’s houses of worship. The group they formed to that end eventually became part of the province-wide Conseil du patrimoine réligieux (Religious Heritage Foundation), which still lives, still receives funding in support of its restorative mission. Toward the end of the decade, with the help of Abbé Claude Turmel, then secretary of the Conseil, the Bagg Street shul applied for, and won, a grant of $350,000 — to replace the roof, to repair an outside wall that threatened the adjacent street, to change the rotted windows, to redo the bathrooms, which by then were unusable and disgusting beyond description, and to finish the basement. There is a photograph in the shul of our much beloved Louise Beaudoin, Minister of Culture and Communications in 1999, speaking from the bimah to the television cameras below her in the ceremony that capped the completion of the work. Much as we owe to Joe, we note, with gratitude, that the Quebec Government, Joshua Wolfe and Abbé Turmel are all big players in the story of the shul’s survival. Among other things, they gave us our party room. 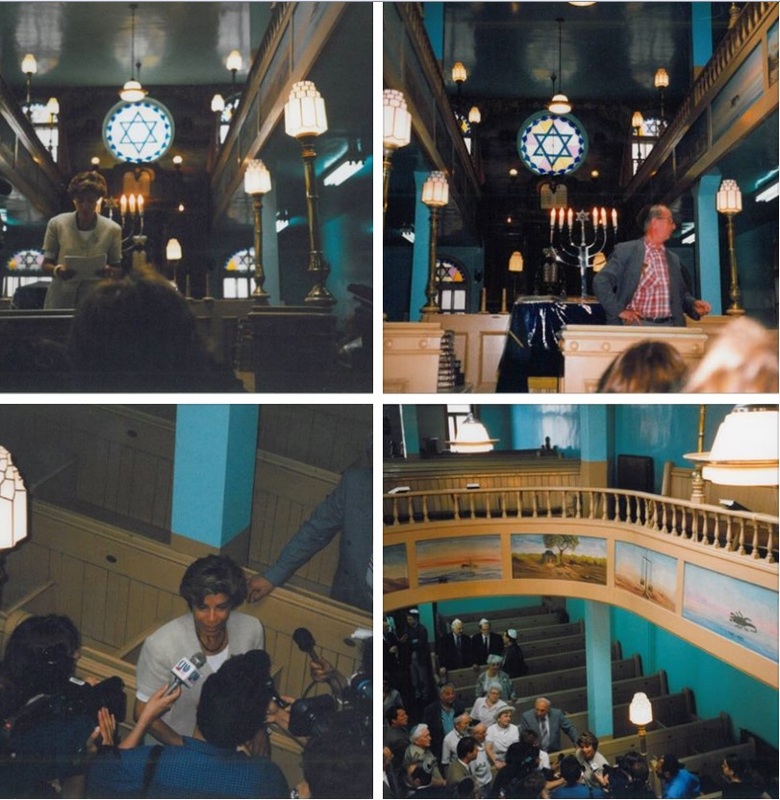 Quebec’s culture minister Louise Beaudoin designating the Bagg St. Shul as a Religious Heritage Site in front of reporters in 1998. The intervention of the government was a one-time affair. It actually did little to slow the effects of ongoing poverty and neglect. The building, always dirty, kept getting dirtier; and the congregation, getting older, kept dwindling. The guard began to change with the death (c. 1997) of Mendy Berson, purveyor of tombstones from an iconic yard around the corner on St.-Laurent Boulevard, and till then, the shul’s treasurer. The man Joe called upon to take his place is Baris Kaplan’s oldest grandson. 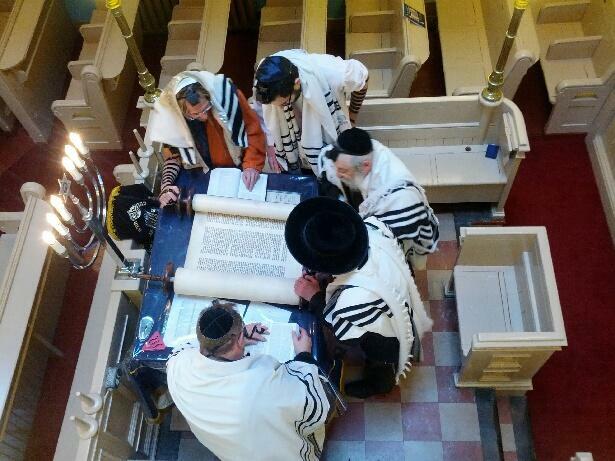 In the spring of 2006, the treasurer became the Torah reader as well, and in so doing, completed a circle, his great-grandfather (Baris Kaplan’s father) having stood on the same bimah, bearing the very same name and filling the same role, when the shul opened its doors in 1921. In August 2009, Joe himself passed away. And the story began a new chapter. Beautifully written history, beautifully designed web site. A story that warms the heart.